For 12 years the Gladstone Hotel has been bringing Toronto audiences the cutting edge of art and design. Come Up To My Room is unique amongst exhibitions because we invite artists and designers to transform our 125 year old Hotel with brand new site-specific installations, rather than just curating existing work. The curators share the risk with the artists and trust them to push their practice beyond even their own expectations. This means that until the show opens, even we are not quite sure what will happen! During the 10 days of the exhibition we invite you to come and explore with us; to meet the artists and designers, to engage in our interactive events, to rock out at our parties and most of all experience the vanguard of up and coming Canadian design. TED talks meets Letterman. This talk-show style conversation will uncover the unconventional paths designers take to get to where they are today. Host Zahra Ebrahim explores the perspectives, implications and practices of DIY designers who are emerging and challenging institutionalized norms. Ebrahim will ask fellow creatives to tell the story of how they grew up to be designers, even if that did not involve going to design school, doing an unpaid apprenticeship and buying an oxford collar shirt. The evening will be co-hosted by Fluffy Soufflé’s house band The Fixies: a prog folk feminist experiential musical collective. Art Party meets Homecoming. Kick off your CUTMR 2015 experience at the Opening Reception. Be the first to see the show and mingle with the artists and designers while their eyes are still glassy from installing. Now that CUTMR stretches over 10 days, this allows you to reconnect with the design community in the week before the busy period that is the Toronto Design Offsite Festival. 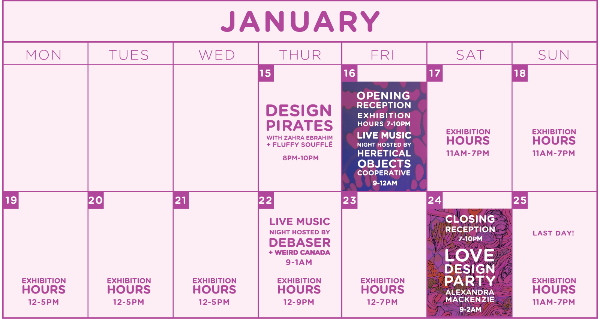 But don’t fret, the CUTMR Closing Reception party will be as wild as ever and coincide with the Love Design party (TODO Closing Party). Live Music meets Design. Carry on with the party. Following the Opening Reception Party is the Any Way You Like live music event hosted by Heretical Objects Cooperative. Experience some of the hottest bands coming out of Toronto and Montreal in a multi-media environment. H.O.C consistently works with artists and collaborators whose varied visions are bound together in the spirit of collaboration and a total observance of existential DIY tenet “group think, group do”. Weird Canada exists to encourage, connect and document creative expression across Canada. They are curating a night packed full of their favourite bands in the Canadian music scene. Weird Canada is the destination for emerging Canadian music, literature, spaces, ideas, and art. It was founded in 2009 by Aaron Levin and Marie LeBlanc-Flanagan in Edmonton, Alberta. Debaser is a radio show on CIUT Montreal, they also are a collective of DIY show promoters based in Ottawa, Montreal & Toronto. “Why is it so loud in here?” meets Art House Freaktown. Calling all Art and Design freaks, get here early for the party of the year! 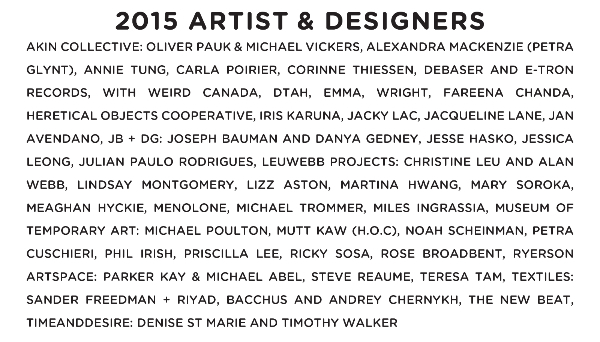 Come and celebrate CUTMR 2015 with the artist and designers. After a full week of art and design without boundaries, experience the last night of the exhibition with a drink in hand. Come for the art, stay for the Love Design party. Magical Fairy Utopia meets Club District. Get lost in the fantasy land of artist Alexandra Mackenzie and get ready to dance. Mackenzie, a.k.a Petra Glynt, transforms the Gladstone’s ballroom for our annual Love Design Party. “Raising Her Spirit In A Promised Land” is a utopia of installation, drawing, mural, painting, psychedelic digital gifs, and audio collage. NOW Magazine describes her work as “fantasy pages from the greatest 70s sci-fi colouring book that never was.” Mackenzie’s music and art expresses her concerns about issues involving the environment, our ever-changing climate, indigenous rights, identity and appropriation. 12 years ago Come Up To My Room (CUTMR) was launched by founders Christina Zeidler and Pamila Matharu as a response to a growing need for an event that provided space for experimentation, interaction and a platform for risk within the design community. Coinciding annually with the juggernaut Interior Design Show (IDS), CUTMR has since become the cornerstone of the alternative design scene. Over the years CUTMR has featured the work of hundreds of Toronto artists through site-specific, immersive installations that bring together diverse media, visions, skills and views that contrast and compliment the current art and design panorama. This year, returning curators Robert Cram and Jaclyn Blumas are joined by Caitlin Plewes from Craft Ontario. This year they present a full palette of emerging and established creative talent from Toronto’s art and design community. This strategy includes utilizing the 4th floor of the hotel as a hub for graphic designers, inviting a multidisciplinary design firm to create an exterior installation, and encouraging collaborations and explorations between the mediums of sound design, electronics, traditional craft, multi-media art and sculpture throughout the hotel. Extending the CUTMR exhibition to 10 days allows the public to explore the curated crevasses, corners and hallways of this historic hotel. “Old ideas can sometimes use new buildings. New ideas must use old buildings” – Jane Jacobs.